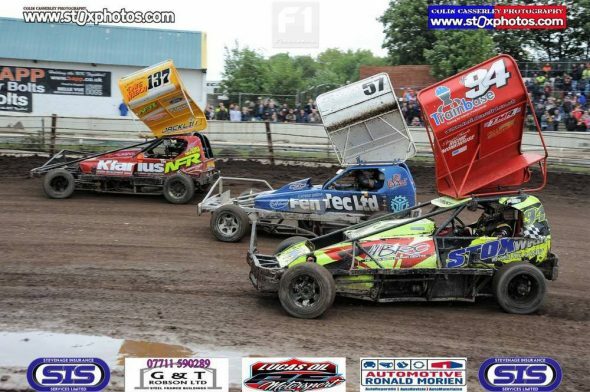 The 2018 battle for the silver roof got off to a flying start at Kirky Lane with a number of shoot out contenders involved in incidents and skirmishes throughout the evening – if they can keep this level up for all ten rounds this series could be a classic. 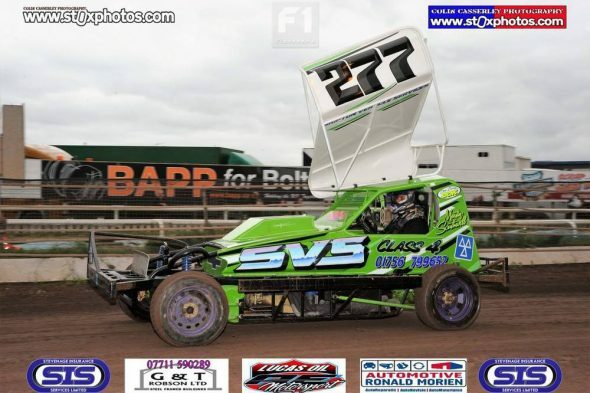 Heat one for this Trinity Diesels sponsored event raised 17 cars including Jelle Tesselaar (H410) who had taken in the F2 World of Shale final at Stoke on the Saturday night before heading for Manchester. 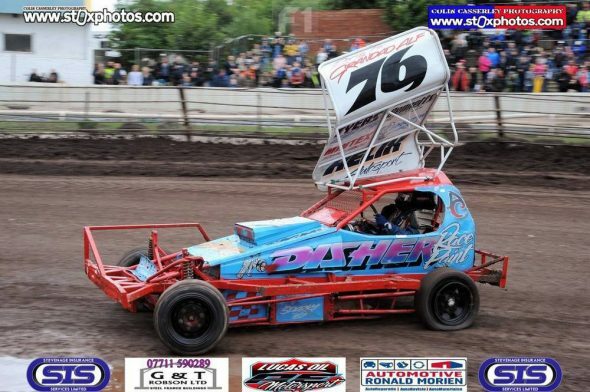 Martin Southwell (277) led them away in his very smart re-built car while just four SO contenders made the start, Mat Newson’s number 16 failing to find the right combination of fuel and spark while Stuart Smith (390) ground to a halt on the opening lap. 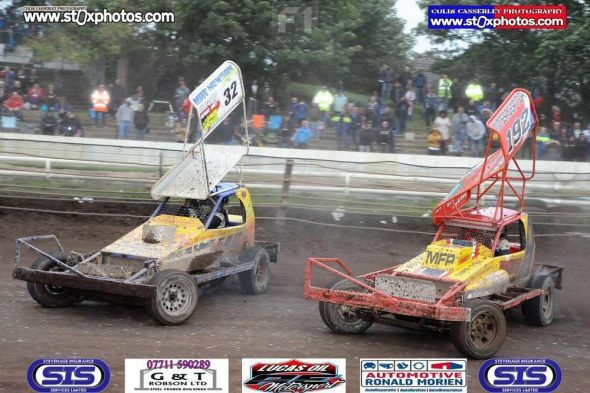 Luckily for Stuart the race was cautioned and a complete restart ordered. 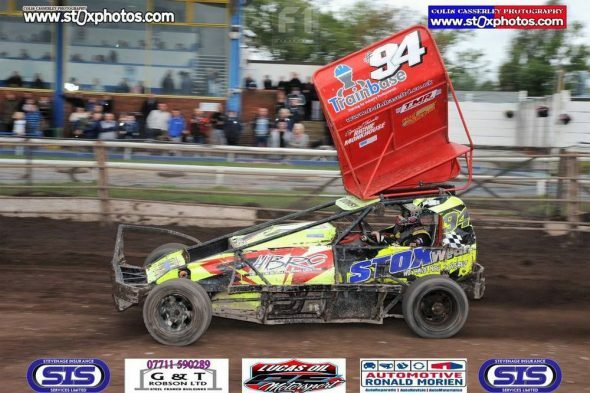 Dan Johnson (4) pushed Tom Harris (84) out into the loose stuff before taking the green flag as Chris Farnell (32), in a Newson hire car, took the lead from Southwell and Karl Roberts (313). 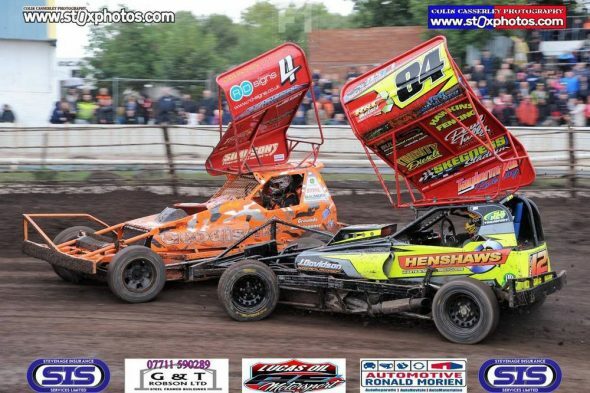 Harris got a revenge hit in on Johnson then forced him into the turn two wires while Southwell and F2 Euro champion Steve Mallinson (310, using the 495 Howarth car) both found the fence on turn three. 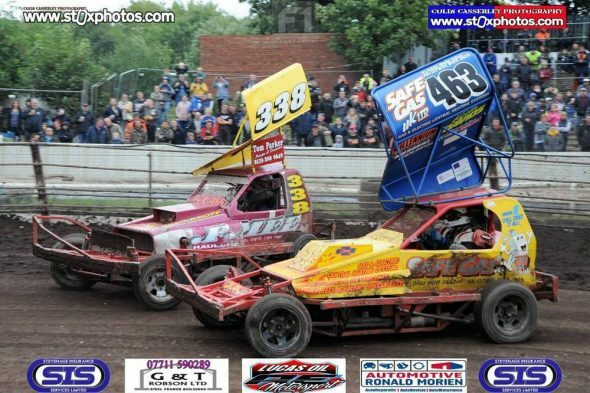 You could almost feel Johnson’s desire to get onto the 84 back bumper but delayed by a wayward 277 car he lost ground. 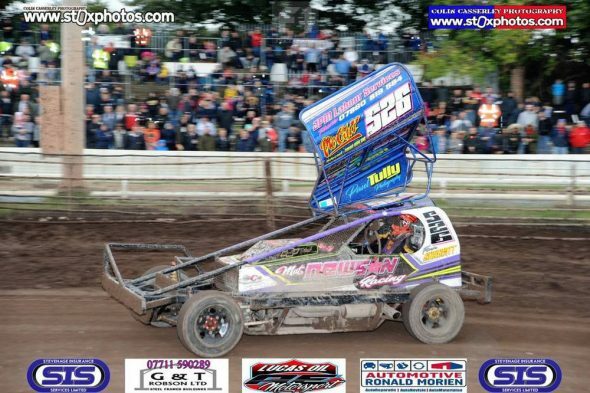 Meanwhile Smith caught second placed Bobby Griffin (166) at the half-way mark and looked a good bet for the win until he tangled with Harris on turn two, leaving Johnson with nothing to do but overhaul Griffin and Roberts with a couple to run. 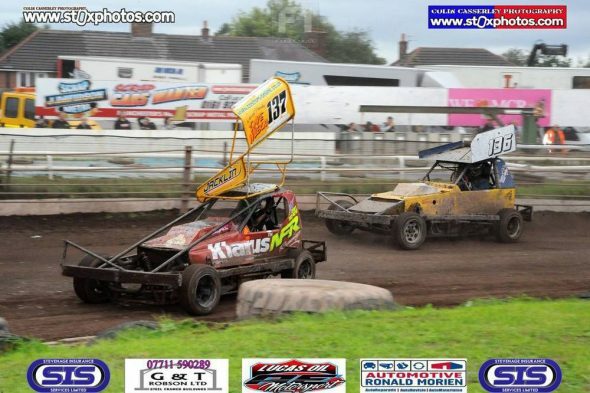 On the last lap Smith whacked Harris wide in the pit bend so Harris side-swiped Smith coming off turn four. 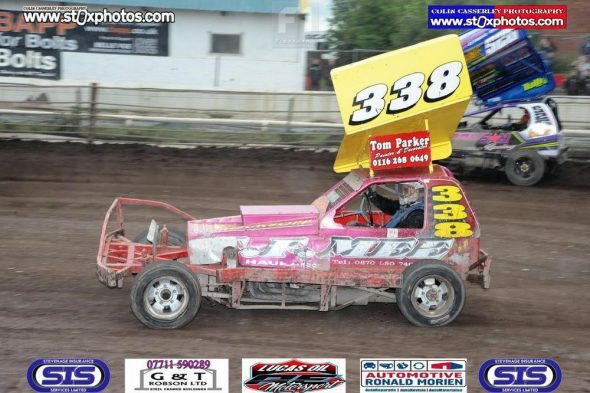 More please! 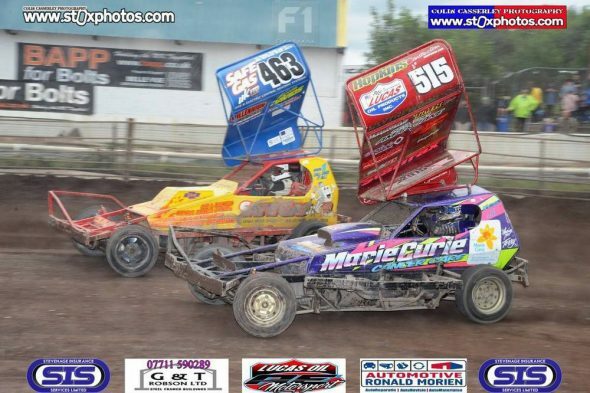 Dowson, Fairhurst, Hines, FWJ and FWJJ made up the five SO drivers for the 16 car heat two. 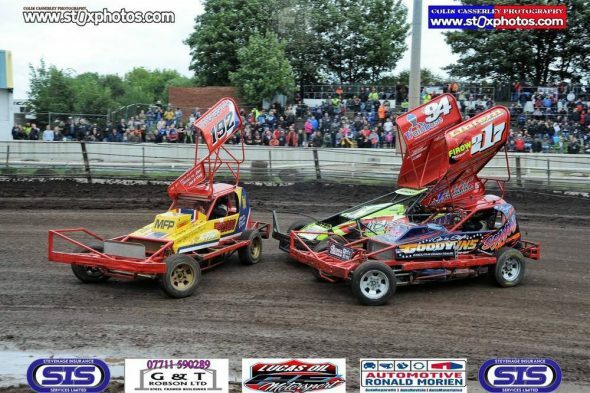 No Newson as shoot out drivers can only race in their scheduled heats. 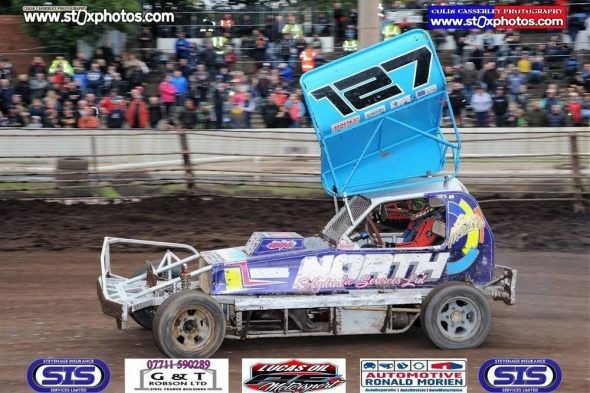 Sam Jacklin (137), always worth watching, pulled out a half lap lead over France (216) and Fenwick (57) while Frankie Wainman Junior understeered on every bend, losing place after place – car set up for a drying track maybe? 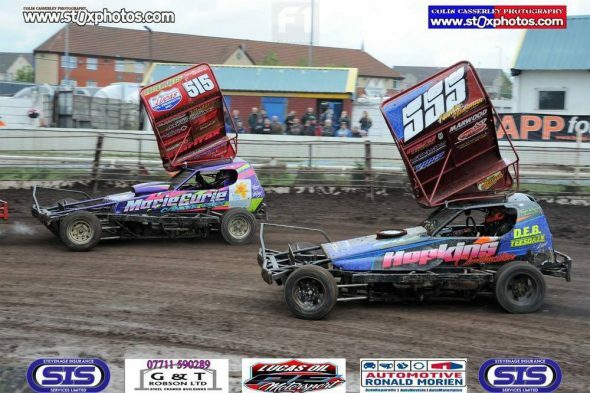 Jacklin maintained his huge lead, France conked out on the back straight and as the track dried the 515 car made up for lost time. 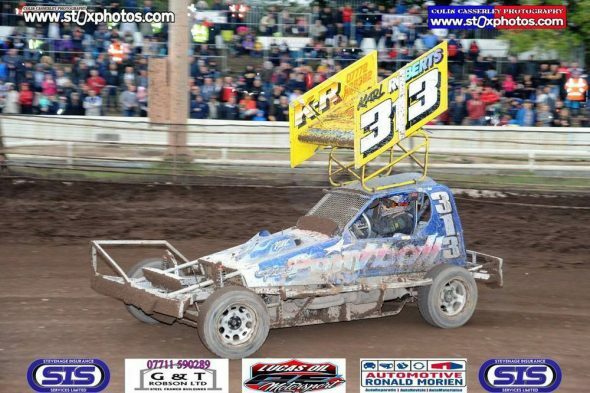 “Mr Belle Vue”, aka John Dowson Junior (94) took over at the front but he too was understeering the bends allowing Fairhurst to close with three to run. 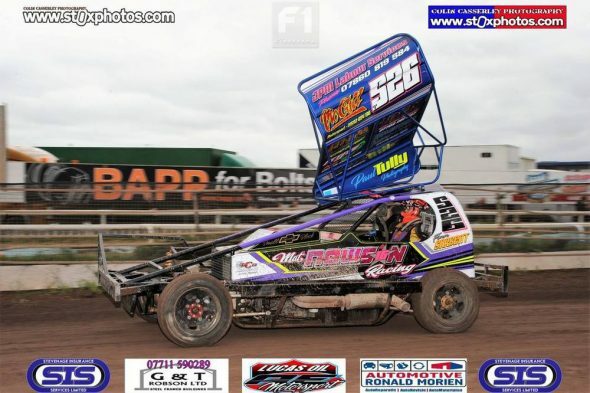 Two to go and Fairhurst challenged, Dowson resisted and FWJ drew level with the 217 car. 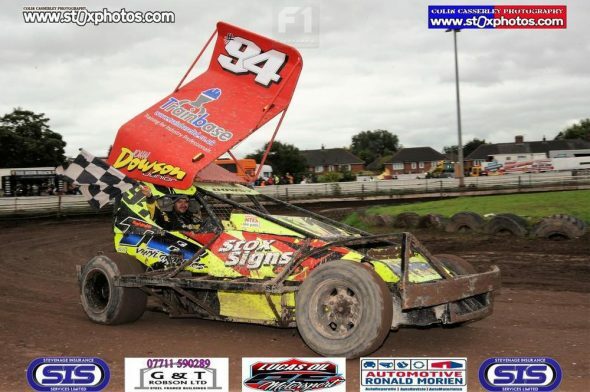 Dowson went clear but a 515 attack on the last bend saw the Silsden superstar second at the flag. 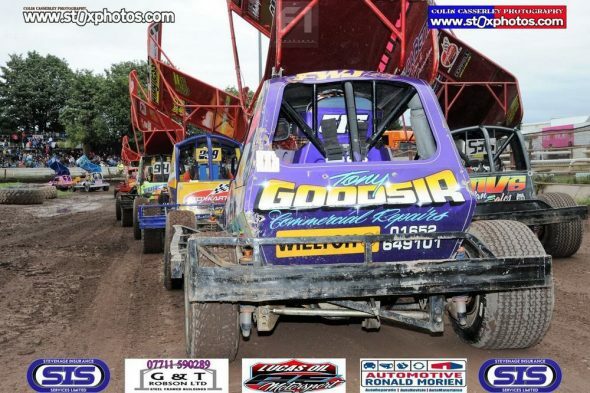 Seventeen out for the consolation, including late arrival Nigel Green (445). 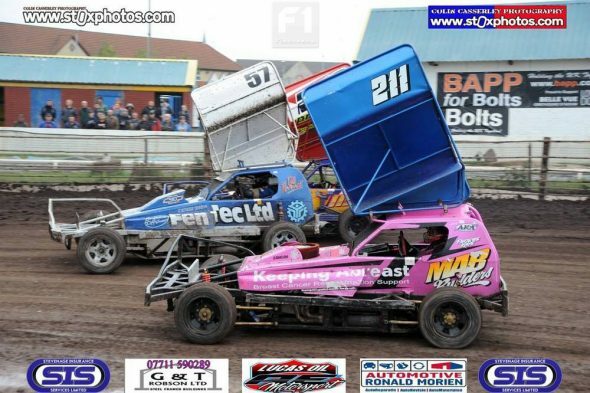 Griffin and Phoebe Wainman (211) tangled before the green flag, losing most of a lap as Farnell led while Green really struggled to make any progress and talking of Progress, Paul Hines (259) wasn’t doing too well either. 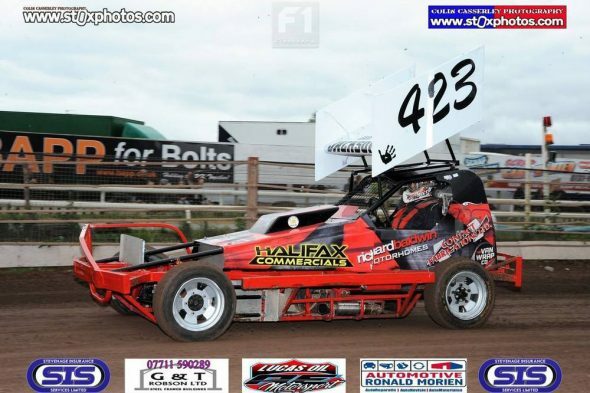 Newson chased down Farnell with two to go with Plant (364) a good third from Mallinson and Moore (127). 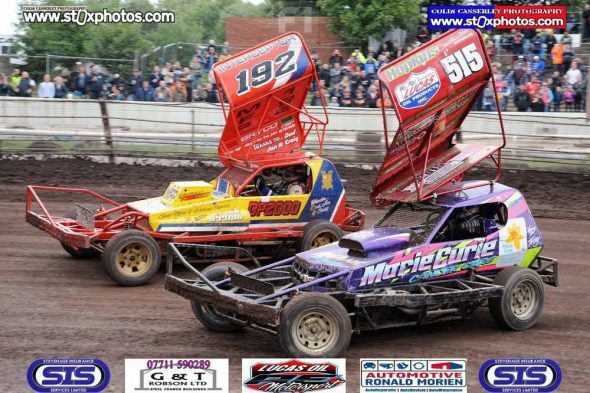 Hines finished sixth but Green could only manage ninth. 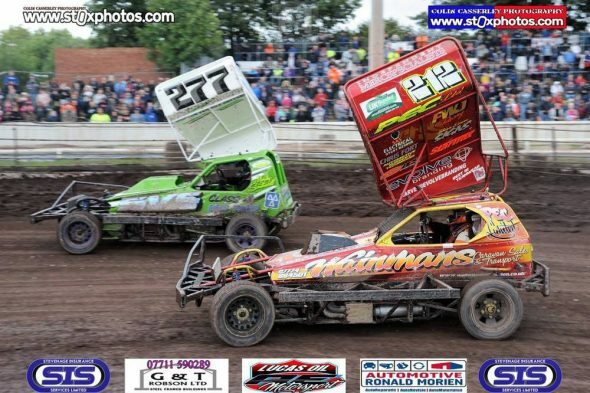 A full 26 cars for the final and right from the start Johnson tried to take Harris around, unsuccessfully. 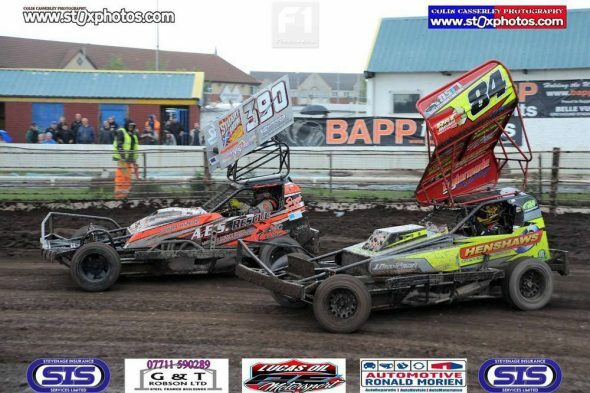 Harris then tangled with Smith on turn two, both piling into the infield tyres as Jacklin led. 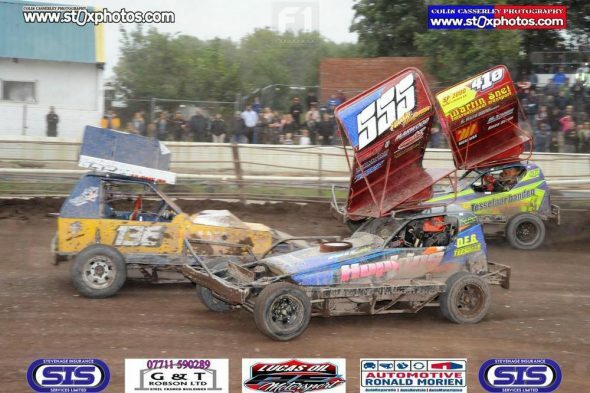 Fairhurst clobbered a Makim/Griffin road block on turn four, popping a front tyre while Harris continued to circulate. 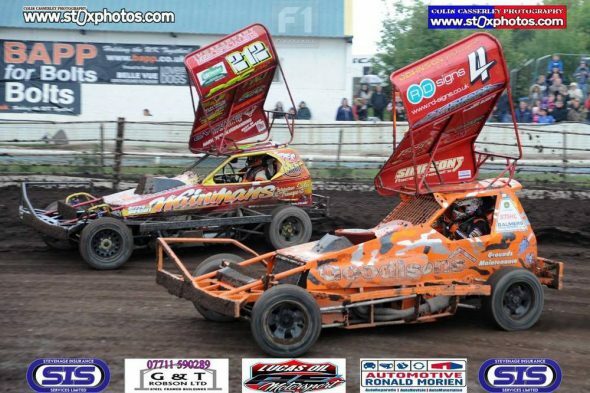 FWJ made a lightning start but Green had sorted his problems and went second, with FWJ taking third off Tesselaar. 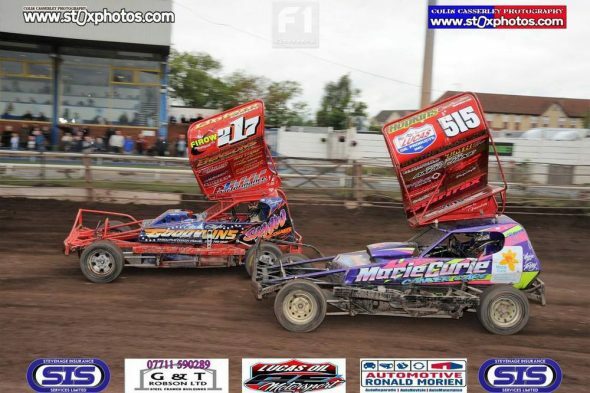 Green took the lead, went wide and Jacklin took the place back as Green’s mechanical woes returned. 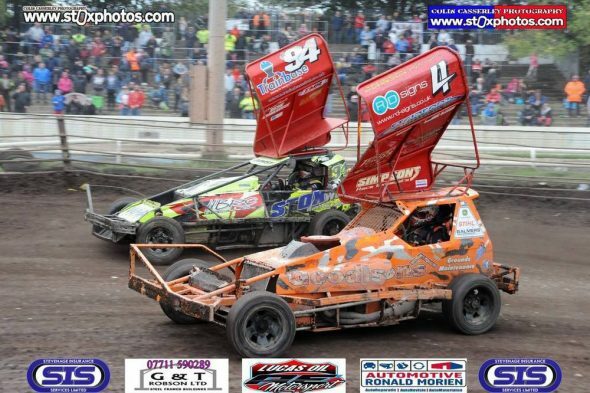 Wainman challenged Jacklin on the tote bend, got it wrong and lost out to Tesselaar with Johnson lurking in third. 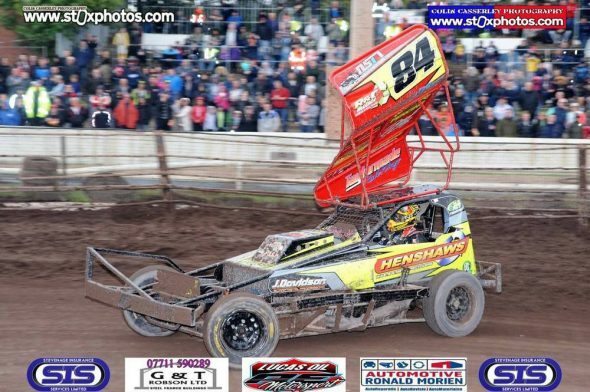 Tesselaar spun the back-marking 93 car, losing time and the lead to Wainman in the closing stages but Johnson shadowed his every move and a last bend attack was inevitable. 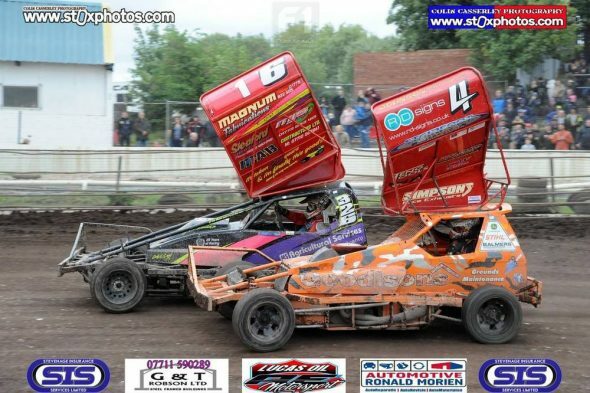 Wainman looked to have the edge but Johnson attacked late coming off turn four, turning the 515 car but trapping himself into the bargain. 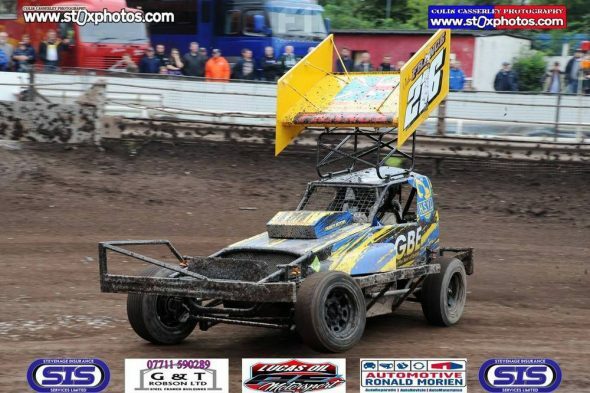 Jelle cruised by the pair for the win with Dan just making second ahead of Smith. 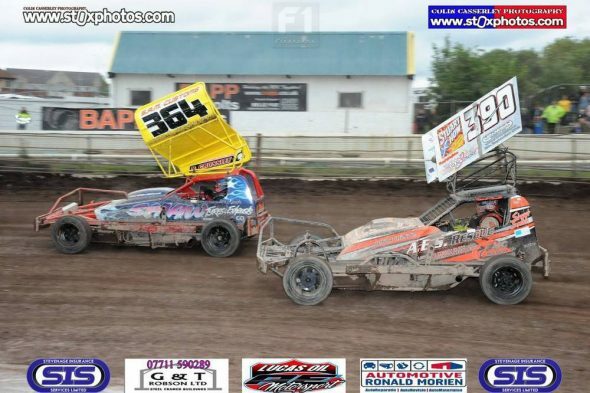 FWJ scraped home in seventh spot, ahead of 555 and 259. 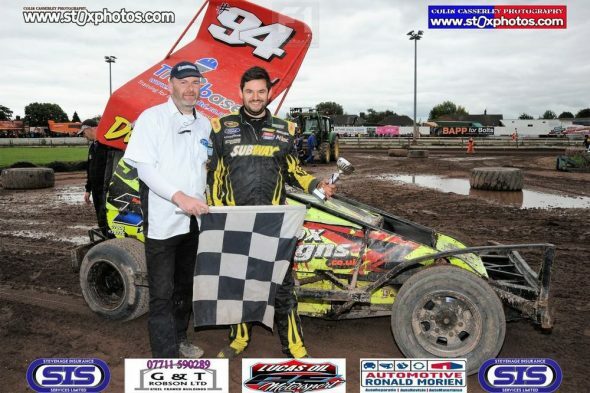 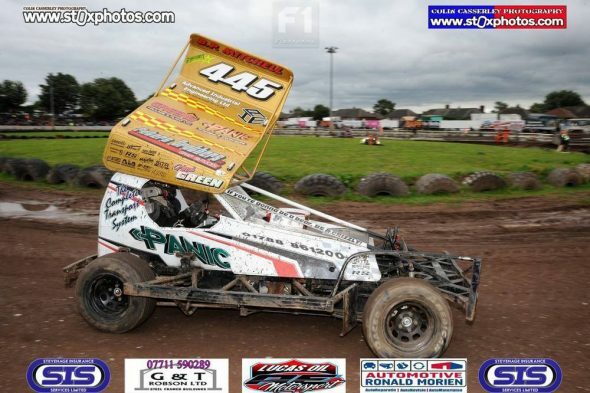 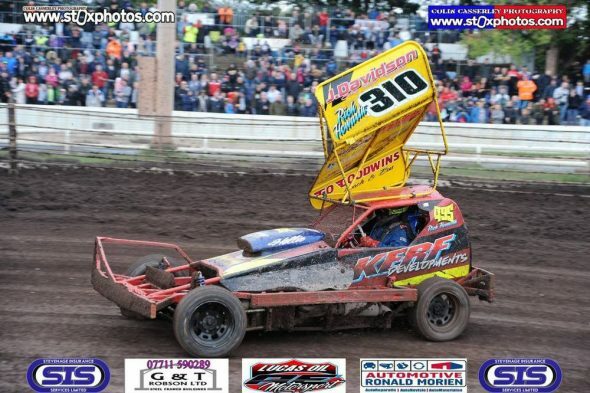 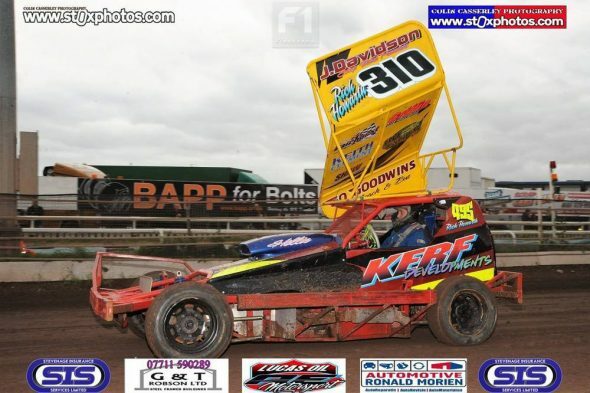 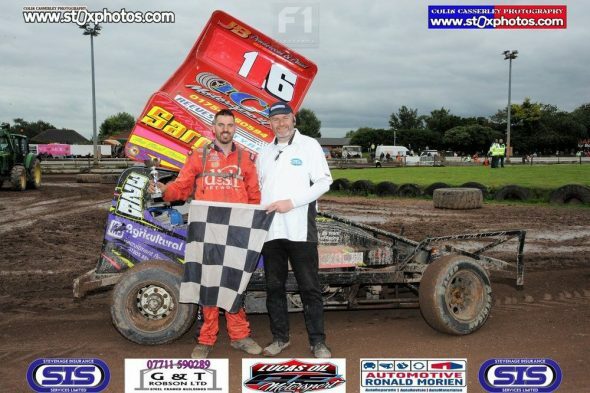 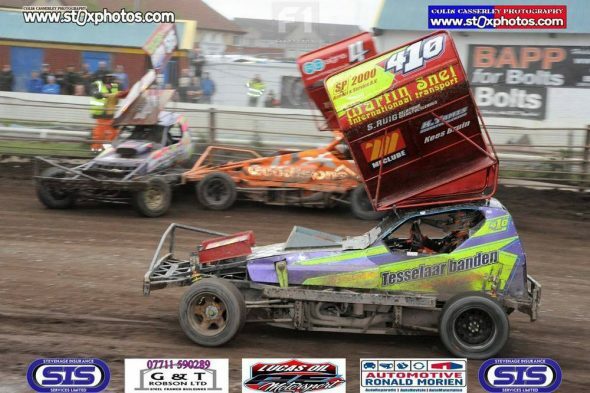 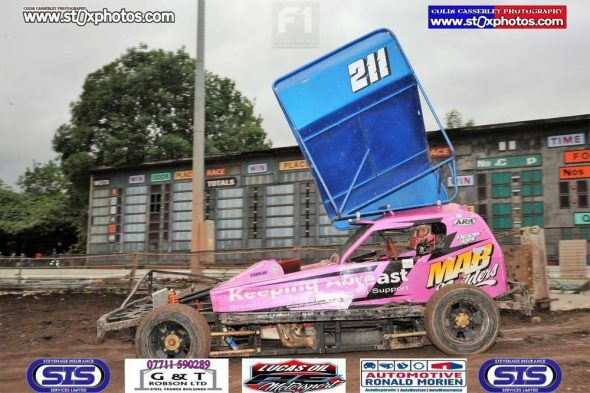 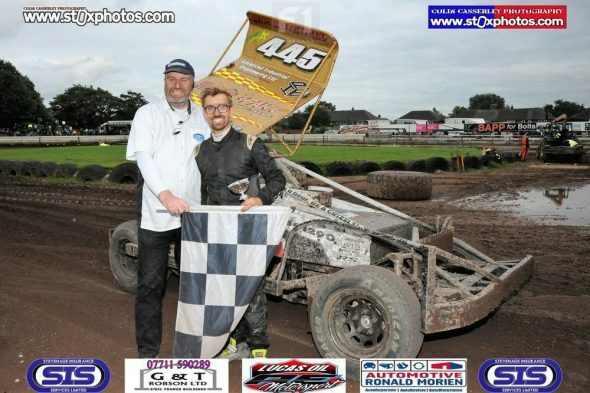 Tesselaar’s win made him the first Netherlands driver to win on UK shale since August 2000 (overseas driver only races excluded) when the late Klaas Wink (H253) took top honours in a normal F1 meeting at King’s Lynn. 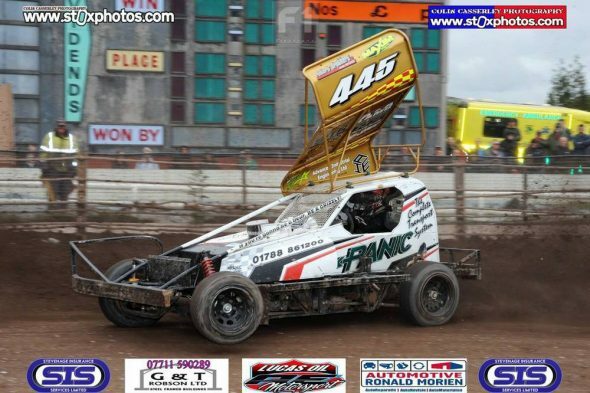 Nigel Green finally found success in the 24 car grand national although Harris looked to on a mission until he tangled with Morris (463) and Smith (again) on turn two (again). 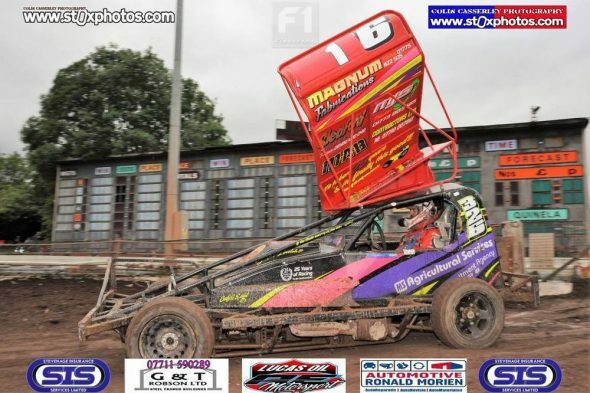 Phoebe Wainman hit the front and was really flying until Green arrived on the scene. 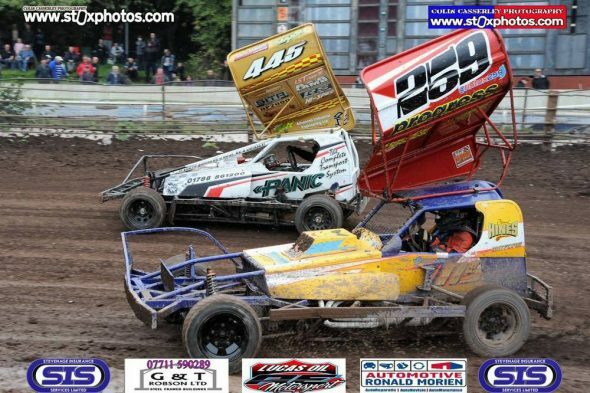 He was pushed wide by France and Phoebe retook the lead, only to drive into a turn four pile up handing the top spot back to Green. 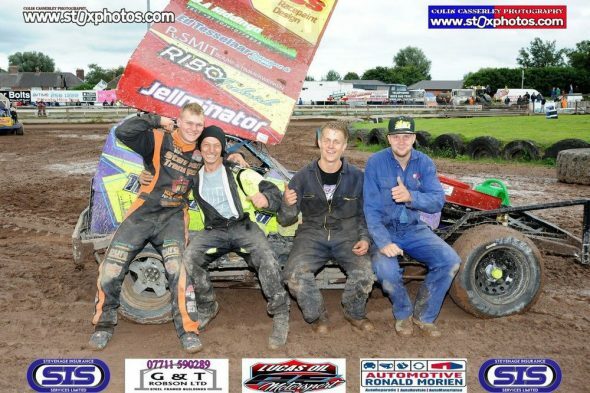 Johnson took second with Fairhurst third while Frankie JJ got the better of his dad to take fourth! 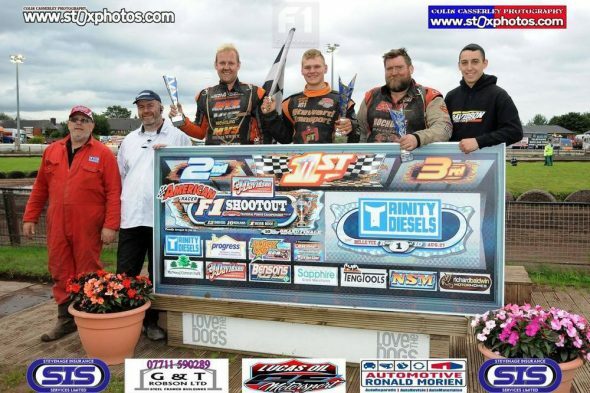 A great start to the Shoot Out series with some excellent F2 racing on the bill as well and all done by 7 pm.